One of the most popular facial treatments that guests came in for when I worked at a spa was a microdermabrasion treatment. While this treatment works wonders, the main problem for most guests was not that they didn’t see results (they did, instantly) but more of an issue because it can be pretty expensive to continue treatments. 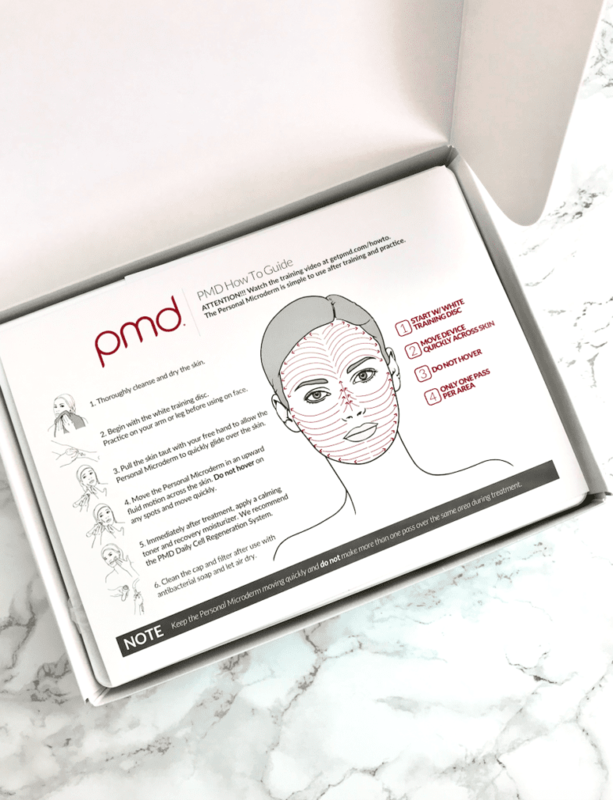 Nowadays, thanks to brands like PMD Beauty, there is an at-home option that works fantastic! 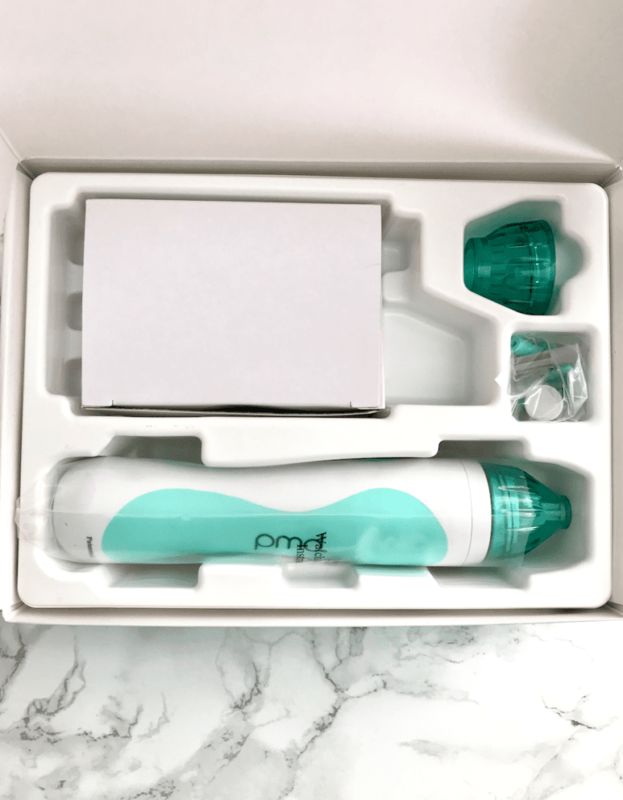 Let me introduce to you the PMD Beauty Personal Dermabrasion Device. 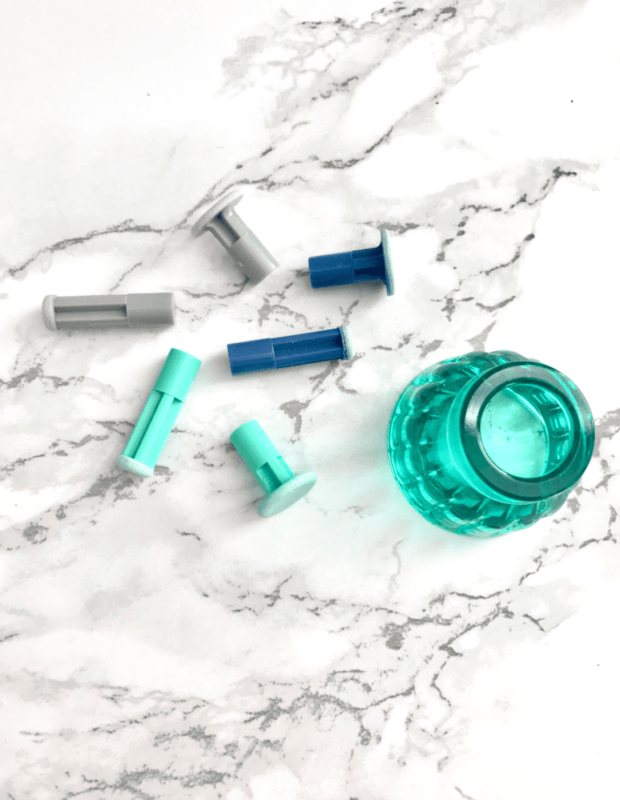 This will be your new favorite skin care tool! If you aren’t familiar with what a microdermabrasion treatment is, the easiest way to explain it is that it is a minimally invasive procedure that gently “sands” the skin while removing the dull, outermost surface layer of your skin. The crystals that are used in the treatment are vacuumed and suctioned away, which helps to increase blood flow and circulation to the face. This treatment is great for helping boost collagen and elastin, but also to help leave the skin softer, firmer and more radiant. It’s also amazing for anyone who suffers from fine lines, wrinkles, enlarged pores, blemishes and dark spots. Sounds great, right?!? 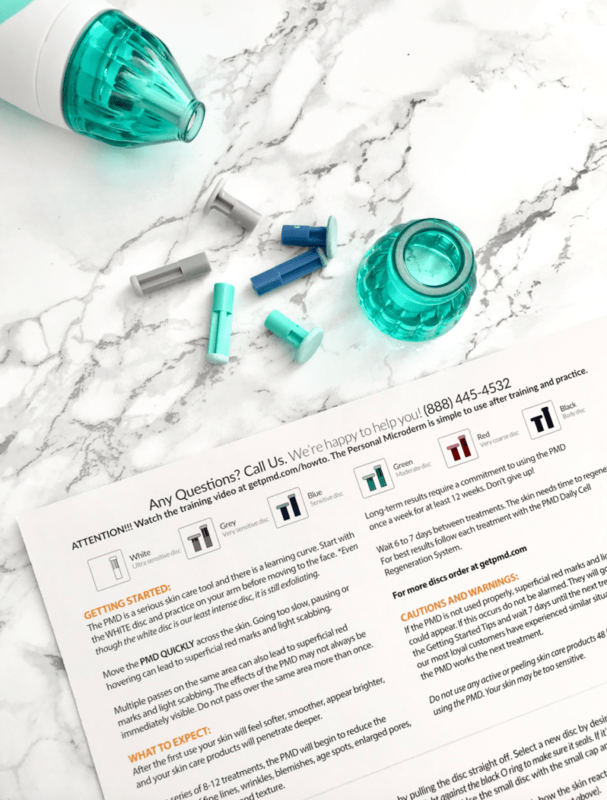 If the thought of doing a personal at-home microderm session sounds intimidating, you aren’t alone. 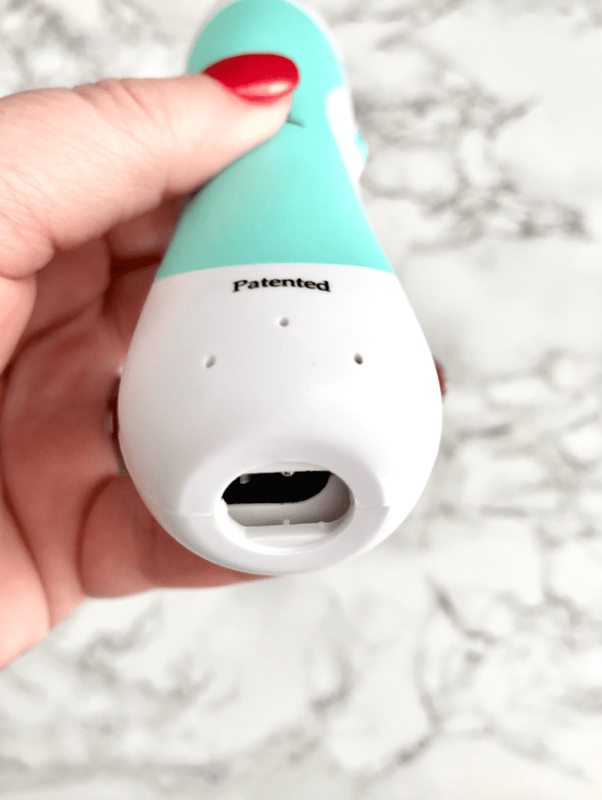 I was nervous myself, but after finishing quite a few sessions I’m happy to report that this is so simple and easy to do at home that I no longer have any sort of fear or issues using this tool on my skin. 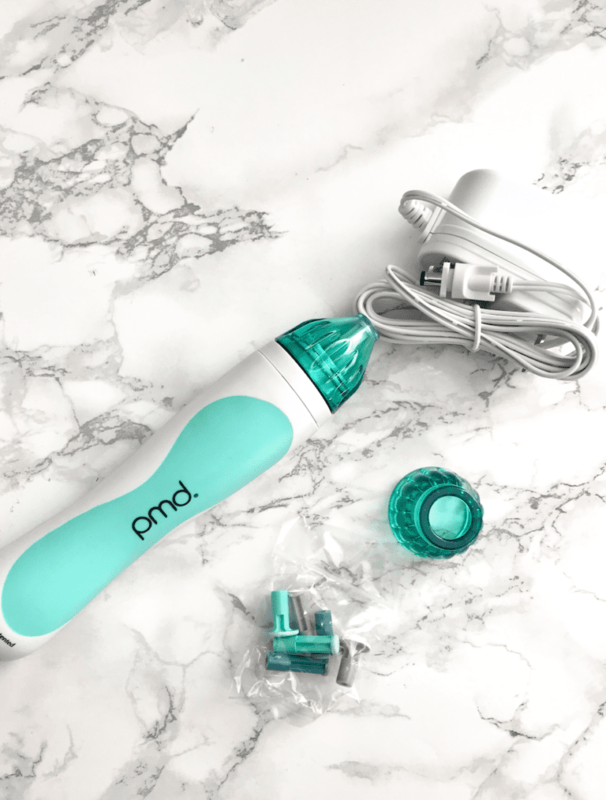 On the days when I do a treatment with the PMD Beauty Personal Dermabrasion Device, I’ll start off washing my skin. It’s important to have clean, dry skin before you start the treatment. I work the device in small sections on my face. I normally start off on my cheeks, using the device in upward motions. You don’t want to apply pressure to this tool, just simply let it suction to your skin and glide it along. Then I’ll move onto my forehead, nose and chin. It doesn’t take long at all and the results are immediate. My skin instantly feels so much smoother and softer. For me, my skin does get a little bit red after using the device, but nothing too horrible. 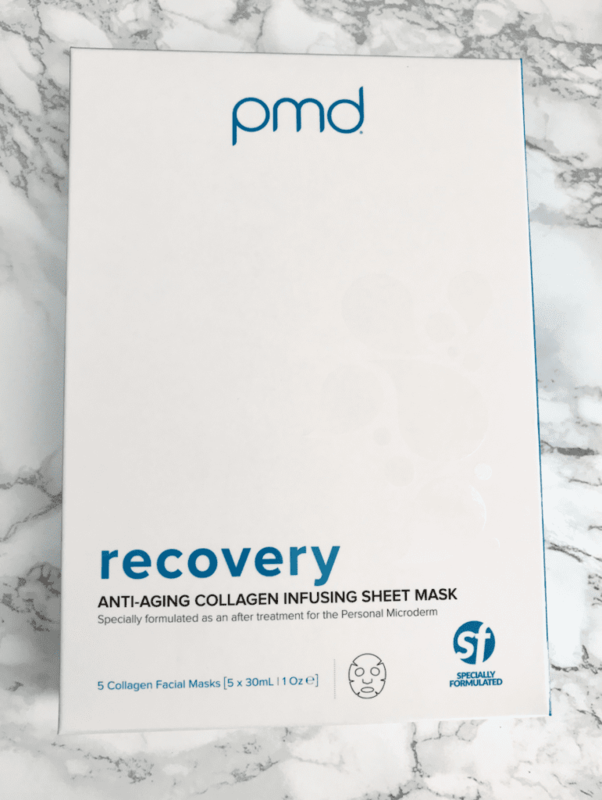 To calm my skin down and to make sure it’s getting a lot of hydration, I use the PMD Recovery Anti-Aging Collagen Infused Sheet Mask. They work wonderful (as long as you remember to not put on the protective backing like I did…several times, instead of the actual mask. Yep, I sure did!) 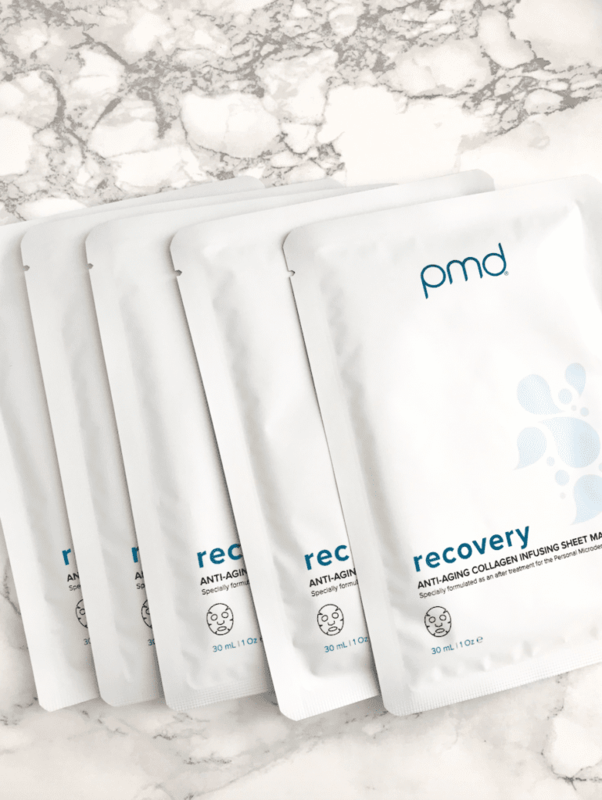 These sheet masks are loaded up with hyaluronic acid to hydrate the skin, acetyl tetrapeptide helps to decrease the release of inflammation triggers and increase the skin’s tolerance level which helps to soothe the skin and help with sensitivity. It also contains collagen which is so important in helping our skin appear young and healthy! As we age, our collagen production slows down and since collagen is what helps keep our skin looking younger and firmer, we need collagen to help keep our skin looking more youthful, firmer and smooth! The sheet mask also features Olive Oil which is loaded up with antioxidants that help protect the skin from free-radical damage and it helps to deeply hydrate the skin without clogging any pores or causing any breakouts. 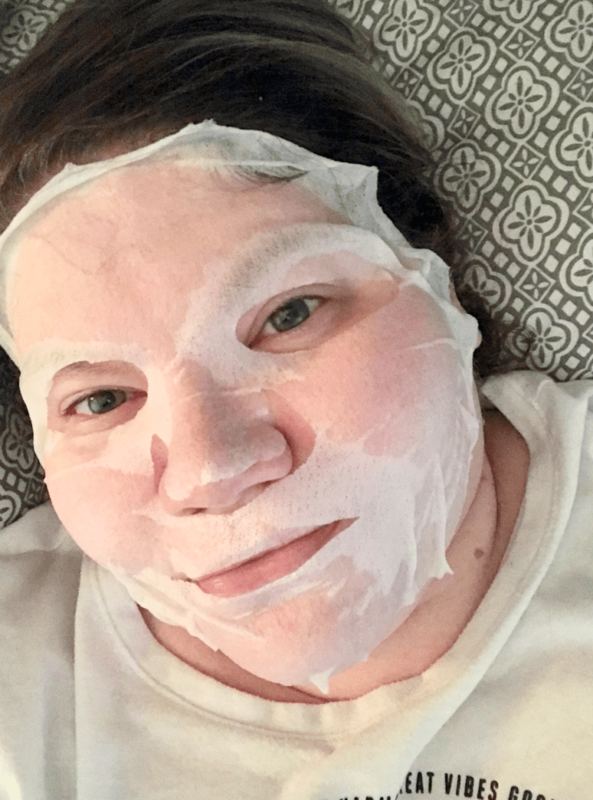 These sheet masks are fantastic! 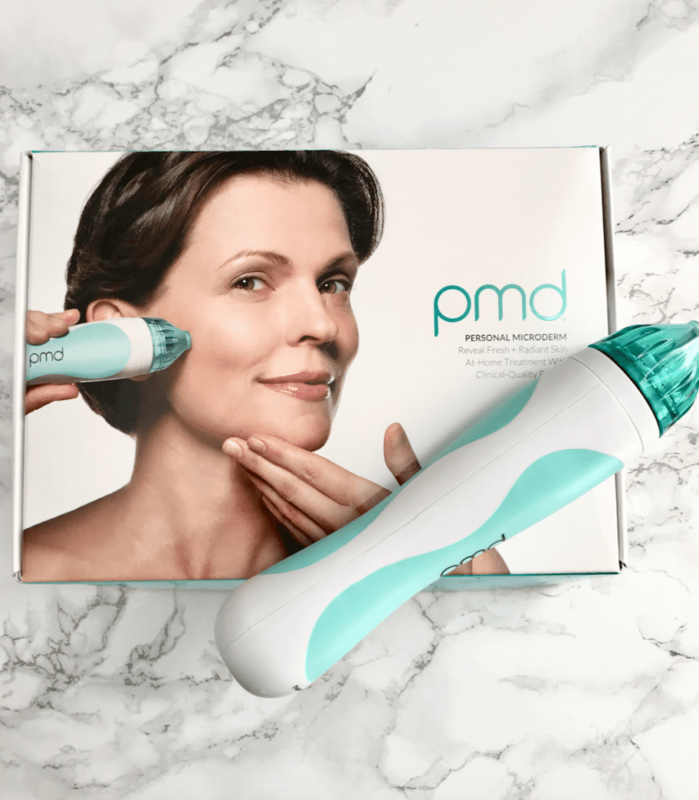 The PMD Beauty Personal Dermabrasion Device works the same as the professional, in-office treatments you can get in a spa or a doctors office. 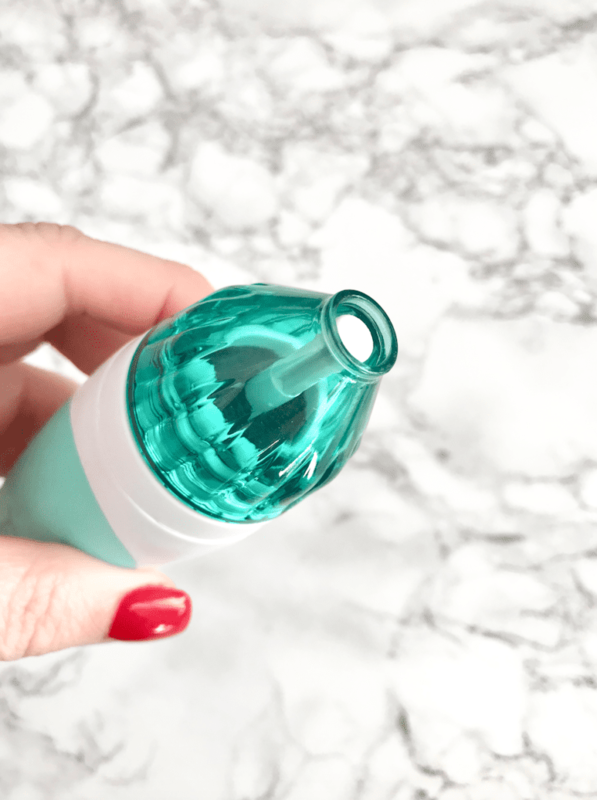 What makes this skincare device do such wonderful things for the skin is the patented spinning disc technology and the vacuum suction. The combination of these two leaves the skin looking radiant and youthful! The spinning discs are embedded with aluminum oxide crystals (which are safe and non-toxic) that help to exfoliate dead skin cells from the surface of our skin. As you glide the device over the skin, the suction helps to increase circulation and also helps to trigger collagen production, brightens the skin and leaves the skin smooth and even in texture. This is perfect for anyone with enlarged pores, uneven texture, blemishes and fine lines and wrinkles. -Allow the skin to dry! You want the Personal Dermabrasion to work properly on your skin and if the skin is still damp, it won’t glide properly! -Test the white training disc on your arm to see how it feels. 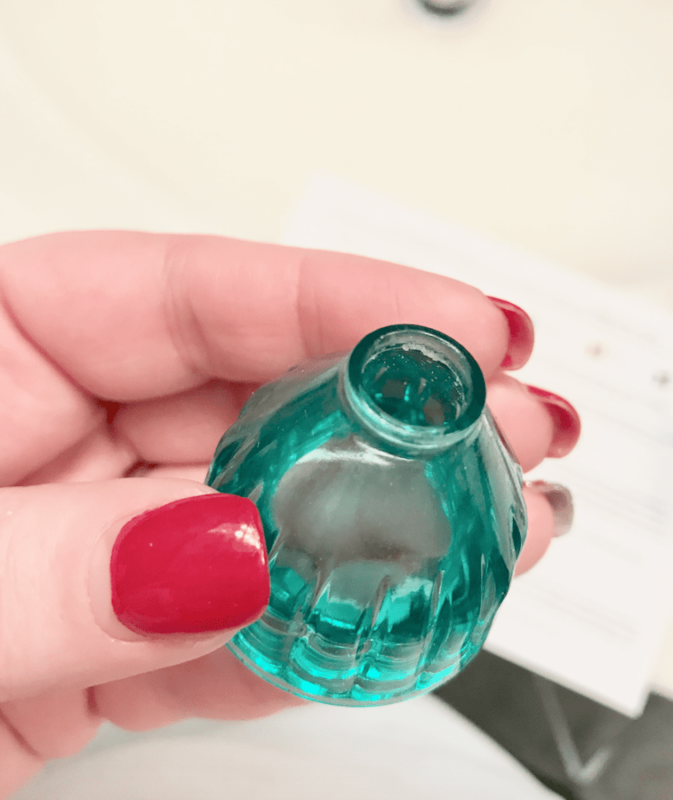 -Using one of your hands, gently pull the skin tight in the treatment area and allow the other hand to go in an upward motion with the device. -Do no more than two passes per area and do not hover over an area. Allow the device to glide on the skin! -After the treatment, apply a toner to neutralize the ph balance in the skin and apply a moisturizer to hydrate. If you have a sheet mask that is geared towards hydrating the skin, this would be a great time to apply that mask! -Let your skin recover! Wait at least a week before you do another treatment. So this device is fantastic for all skin types, BUT NOT for anyone using chemical peels or anyone using products that contain any sort of acids such as hydroxy, lactic, retinoids or Retin A as these should not be used in combination with the Personal Microderm. Your skin could be too sensitive so I’d wait at least a week after stopping using these products before I’d do a Microderm session. Those colorful things are the spinning discs. They go up in intensity as you can see! So start with the white and work your way up! I love that you can easily order more replacement discs online! See that white crud around the top of the opening? That’s my dead skin that it pulled off! YUCK!!! I’ve got some enlarged pores and discoloration that I’d like to work on. Also, since I’m aging (hello, 37) working on preventing fine lines I have from becoming worse is really important to me and my routine! This was after my treatment. My skin is glowing and it felt so much softer. 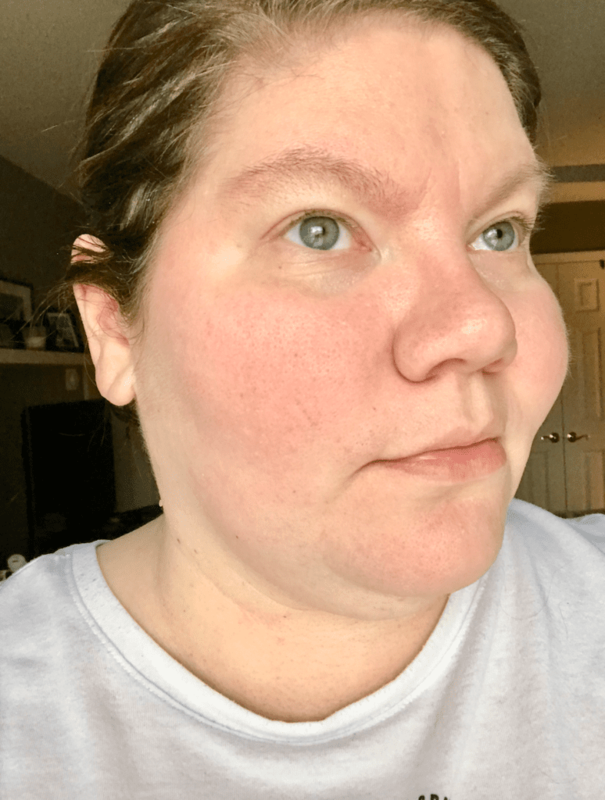 It was pretty red immediately after my treatment, but after I used the sheet mask and applied a toner and a moisturizer, my skin felt and looked so much better! 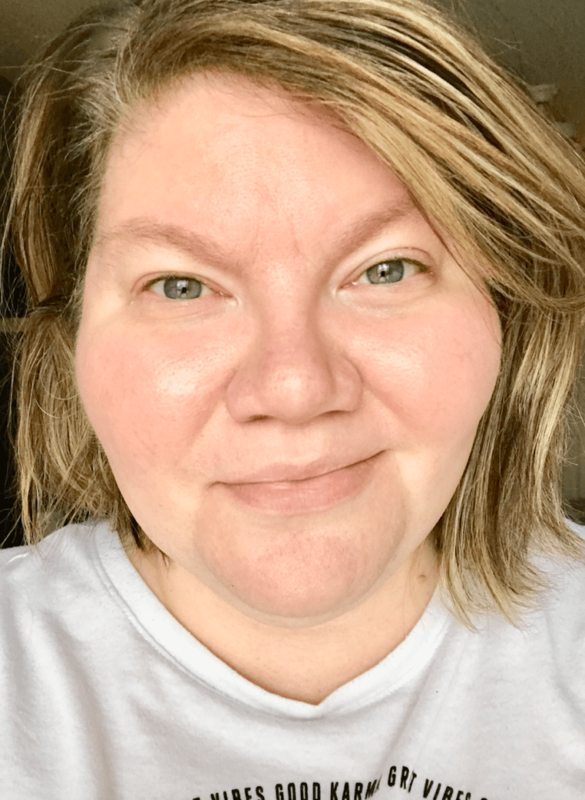 They said that it takes about 12 weeks to see long-term results but I can tell you (and hopefully you can see) that I could see and feel immediate results after my first treatment. I plan on continuing using this so I can see what it will do for me long-term. Plus, it’s great to take the time to work on a little bit of self-care for myself!